Bhaya Classic cruises deep into the expanses of the Bay to rarely visited places of Halong Bay. Kayaking, swimming, and exploring wonderful cave in Halong Bay and Lan Ha Bay are ideal for the keen novice or experienced kayakers. 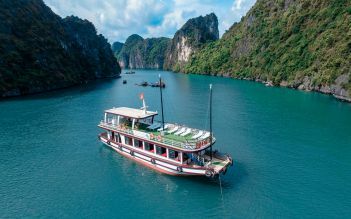 Halong Bay and Lan Ha Bay, the spectacular natural wonders, are also dramatic seascape for those who love to discover and communicate with nature! 07.30 - 08:00 Optional pickup by shuttle bus. Drive from Hanoi to Halong Bay. 17:00 Bar opens for the Happy Hour "Buy one get one free". Take the chance to get more drinks and fun. 08:45 Get ready for the second day’s activities. 09:00 The cruise will pass by Ang Du area, Hang Du, Kong Skull Island filming area to reach Coc Cheo Islet area. Discover the local life of people in Halong Bay while having a special local lunch experience. 12:30 Lunch is served on floating farm in authentic Vietnamese style. 17:00 Bar opens for the Happy Hour "Buy one get one free”, enjoy relaxing time on the sundeck. 10:30 Disembark at Tuan Chau International Passenger Port. 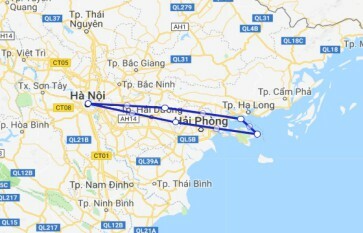 Leave in Hanoi. End of tour. This was a great way to see Halong Bay! We did an overnight cruise and from start to finish we were treated so well! Dom our cruise manager was fantastic and so much fun! He was friendly and funny and made us feel very relaxed and for me made the trip! The kayaking around the bay was very good fun and the food onboard was perfect and so much! My only suggestion is that the bar stays open a bit longer as by 11pm it was shut and we were a group of 5 friend who hadn’t seen each other in a few months. Overall a great trip though! We had a wonderful time on our cruise of Halong bay. From the moment we were greeted off our transfer between s until we left the ship the cruise manager and staff were fantastic. Accomodation was very comfortable and the food was fantastic. We had room 210 on Bhaya classic 1 if you can do it well worth the extra for this room. We met some terrific and super friendly people during our time on the cruise. Happy hours are great times of the day to meet and socialise. Always plenty of things to do with kayaking into the caves a highlight. There were people on our cruise who only did one night which made the second night that much better even the though the passenger numbers are small to start with you felt as f you had the boat to yourself. Would definitely do it again. This two night cruise was absolutely wonderful from the moment we got on board until we disembarked. The staff were so friendly and wanting to make our stay perfect. The food and activities were amazing. Loved every second. I would highly recommend this two-night cruise. My mother and I did a Bhaya Classic Cruise and had a fantastic experience. We enjoyed such a wonderful 3 days with a really good mix of 30 other people. Was so much fun, sea kayaking, swimming in pristine beautiful water. Great food, on the water in a lovely beautiful authentic style Junk boat. Fantastic caring and considerate staff. Fun activities on board and day trips. A must do experience and would do it again.